GN Solids American is dedicated to the supply of quality equipment and fast service. GN Solids American a full range of decanter centrifuge manufacture offering 9 inch bowl, 14 inch bowl, 18 inch bowl and 22 inch bowl decanter centrifuge. GN Houston sale and service center is providing the complete centrifuges and after-sale service. The centrifuge is fed by a feeding tube, which is a hollow shaft connected with the screw. As long as drilling fluids enters a feed compartment and is accelerated to go into the rotating bowl. Once solids go inside the bowl, centrifugal power forces heavy solids settle on the bowl wall and subsequently discharged. The liquid will fill the bowl of fluids dam and flow out. Recently, we have sold three sets of GNLW363 14 inch bowl centrifuge, one set of 22 inch bowl centrifuge and one set of 9 inch bowl centrifuge to Middle East. I briefly explain those three models of centrifuge. 2. GNLW553 is the biggest centrifuge in GN centrifuge series. 400gallon/minutes capacity with advance VFD control panel will meet and exceed most customer expectation. 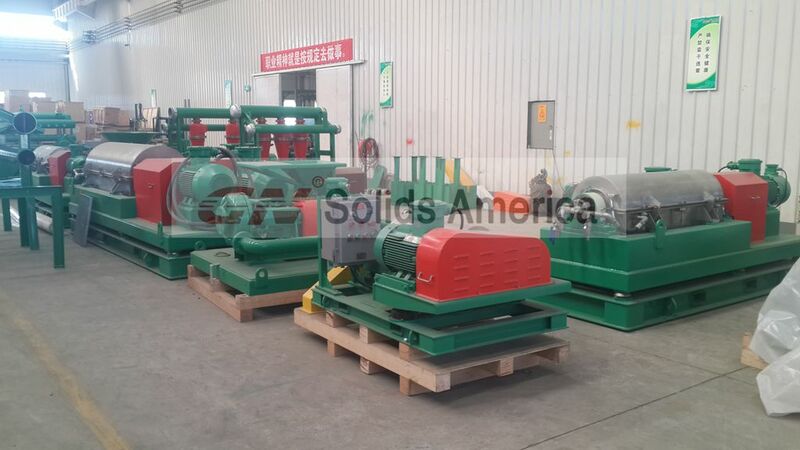 It mainly used in the oil and gas drilling application and dewatering system. 3. GNLW223 is the mini centrifuge which is only 9 inch bowl small footprint. High rotating speed and stable working performance are welcomed by the most of diamond drilling company. It specializes to separate the fine solids from drilling fluids. Except those models, GN also supplies the 18 inch bowl centrifuge for recycling drilling fluids. Currently hundreds of GN decanter centrifuges are working worldwide to produce a high value to contractor. With experienced engineer and innovative technology, GN is capable of increasing value to your project.